Our range of products include coir pith grow bag making machine. We hold expertise in manufacturing Coir Pith grow Bag Making Machine.These are manufactured using quality material in our advanced manufacturing unit. 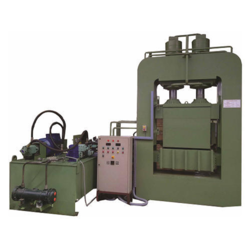 The hydraulic pressing machines are equipped with single acting-spring return cylinder unit in down stroke directions. These are manually operated hydraulic hand pump with single or double lever type pumping handles. One is used for slow speed and other for normal speed of ram movement.